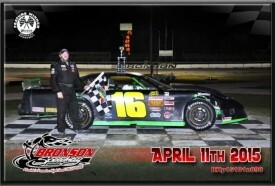 Kevin Durden returned to the high banks of Bronson Speedway in the “Pork Chop Wilson” owned # 56. Durden’s car looked hot just rolling out of the trailer and when it took to the track, the stop watch doesn’t lie…Lightning fast…. however in the tweaking of the set up process, disaster struck…Engine issues would side line the well know Durden and his come back to Bronson Speedway would be delayed. In the Limited Late Model Sportsman feature Patrick Mennenga would make a come back of his own, after battling some engine issues. This night however the power house was strong, and sang to the tune of a much deserved win when the checker flag waved. A smiling Mennenga said in victory lane “Were Back” in Jack Nicholson style. The Purestock division provided come back of the night. 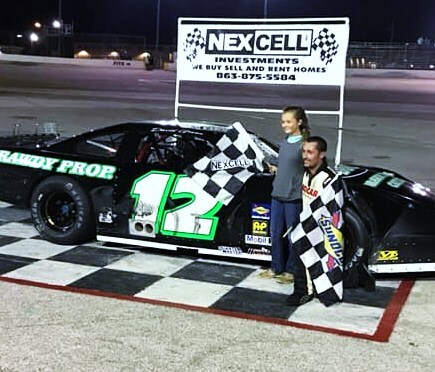 Devin Curl charged to victory lane again this week after being D/q’ed in tech last week for an engine rule infraction. Curl’s team went home, did work, and came back with one goal, put that car right back in Victory lane. Not only did he come back from the D/Q of last week, but after being involved in an early race spin with Tommy Jones and starting from the rear, Curl showed the crowd that his victory would not be denied. Lap after lap Curl worked the car past the other competitors until he had the rear bumper of past champion and mentor Larry Welter in his sights. Curl had to work hard to make the pass outside of hard charging Larry Welter Jr. Curl’s victory this week served notice he will be a threat to take down the win each week. In the Strictly Stock division a mild mannered Mike Brooks drove the race of his career to date, leading most of the race until the last lap. Brooks held a commanding lead so much so, that lapped traffic played the pivotal role in the outcome of this race. Having to choose a way around lapped traffic Brooks lost the commanding lead as he slowed for lapped traffic and the hard charging Brown and Klys were right there. A last lap dash for the cash would deny Brooks his first win of the season. However Brooks like Curl is up in the five each week and his victory is definitely not far in the future. Kenner Brown III would take down the win this week.